Simply put, puppies are adorable. Few can resist the tiny ball of fur with those huge eyes. That cuteness factor combined with their intelligence and delicate physique can make potty training intimidating and sometimes frustrating. Safe and effective training for your puppy will ensure that it is not just potty trained but has good manners overall, develops into an emotionally secure pet and cements a lifelong bond between the two of you. Make sure you have a professional service like Paw Pals to help your puppy through potty training and beyond while you are away or at work. 1. Prepare Your Home Before the Puppy Arrives. Make sure you have all the supplies you will need to welcome your puppy to its new home. You will need puppy food appropriate for its breed size, food dishes, toys, bed, crate or gate for confinement, leash, collar, and anything else you will need for your environment. Having what you need handy will help keep the excitement and anxiety level lower when the puppy arrives at its new home. As part of your preparation, read about the breed characteristics of the puppy you have chosen and anticipate what your puppy may need along those lines. Perhaps your puppy’s breed is super-intelligent, and the puppy would love a toy designed to stimulate that trait. 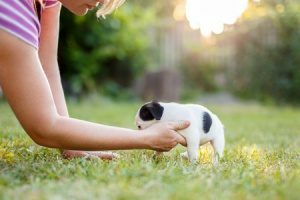 Research how quickly your puppy’s breed understands potty training and set your expectations accordingly. 2. Use a Crate and Establish a Daily Routine. Consistency is the key to effective training, and a regular routine is critical to effective potty training. Lack of consistency can lead to confusion about the rules of behavior. Puppies that are confused about the rules of behavior become insecure adults, and this insecurity can manifest in unpleasant neurotic behaviors, such as using the bathroom indoors. Insecurity can also cause the dog to be afraid. It is not the dog’s fault. Establish a daily routine and stick to it as best you can. Consistency in your routine means feeding, walking, playing, crating/confinement, and sleeping at the same times each day, with the schedule evolving only as the puppy matures. That means confining the puppy at night, waking early, and taking it outside immediately upon waking. Puppies have tiny bladders. They cannot hold it for long periods, so you will have to make many trips outside. You will need to take it outside immediately after playing, immediately before and after being crated or released from a confined area, and immediately after waking from a nap. A regular routine combined with crate training for an hour or two throughout the day at the same times each day is the best way to potty train. 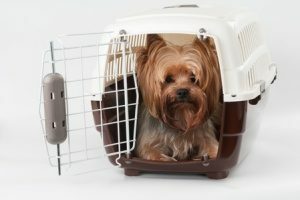 Dogs instinctively avoid messing up their sleeping area, and the crate training takes advantage of that instinct. Taking the puppy outside immediately upon releasing it from confinement will quickly give the puppy the idea that its bathroom is outside. When the puppy uses the bathroom outside, give it lots of praise. Positive reinforcement works very well. Consistency also means picking a word command and always using the same word command, such as “Outside!” when you catch the puppy getting ready to go in the house. Then take it outside immediately. You need to expect your puppy to make lots of mistakes until it is able to understand the rules. Whatever you do, do not become angry or discipline your puppy physically or rub its nose in its mess. It will not work, and it will make your dog afraid of you. You cannot discipline or correct your puppy after the deed is already done – the puppy has already forgotten it and will not understand why you are scolding it. Make yourself smaller when you are getting to know your puppy. Use a softer voice, quieter gestures, and remember that the puppy is smaller than almost everything else in its environment. You are a giant in the puppy’s eyes, so realize that your size is intimidating to the puppy. At first, try to avoid direct eye contact, which is confrontational language when dogs first meet other dogs for the first time, and sit or squat low when you interact with the puppy until it knows you. When you start training the puppy, you should squat or sit, otherwise your back will pay for it. With treats, use really tiny treats to avoid overfeeding. Learn how to use a target stick in your puppy training. When you begin teaching it to walk on a leash, you will want to use a target stick to avoid having to bend over frequently to teach the puppy to heel. 4. Use Happy Voice Tones. 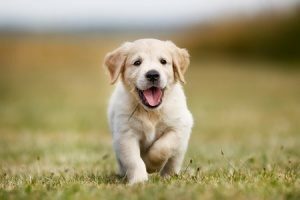 When your puppy goes outside, use its name and tell your puppy in a happy and soft tone of voice what a good puppy it is. If your puppy does something really good, like comes when you call, make it a party! Give lots of love and a treat. Once your puppy learns a command, only give a treat once in a while when it obeys that command. On the point of picking up your puppy, try to limit the frequency of it. The puppy needs to learn confidence in walking along with you and be able to face the world on its own four feet. This includes meeting and interacting with new people and new dogs. This lets the puppy know it has some freedom in movement and helps it to develop good canine social skills. Of course, you need to protect the puppy from potentially dangerous situations, which may include picking it up. 5. Be Gentle When Using Negative Reinforcement. When your puppy misbehaves, use a stern, but gentle, tone of voice. Make sure it is clearly different in tone from your happy praise tone of voice. You do not need to yell or be harsh. And never, ever hit or spank the puppy. Be aware that small breeds are very sensitive and easily intimidated and easily injured. Even aggressive leash pulling can cause serious or even fatal injuries. Negative reinforcement can mean simply turning your back to your small dog when it jumps on you. Tell it to sit, and then pet it when it sits. Be sure to use positive reinforcement at least twice as often as you use negative reinforcement. 6. Play With Your Puppy. Regular game playing with your puppy will help it learn boundaries, such as being careful where it puts its teeth. Play will also reinforce your role as being a source of fun as well as security. Take it outside immediately when it begins to get distracted by interesting smells on the floor. 7. Work With A Professional. Professional training can make the job of training so much easier. Both you and your puppy will learn what to do, and your relationship with your dog will be that much better. If your budget is limited, take your puppy to a group puppy training class at your local pet store. If you have to go out of town, or if you have a full time job, you will need to hire someone to look after the puppy and make sure the training continues in an effective and consistent manner. Use Paw Pals for excellent walking and sitting services for your puppy.